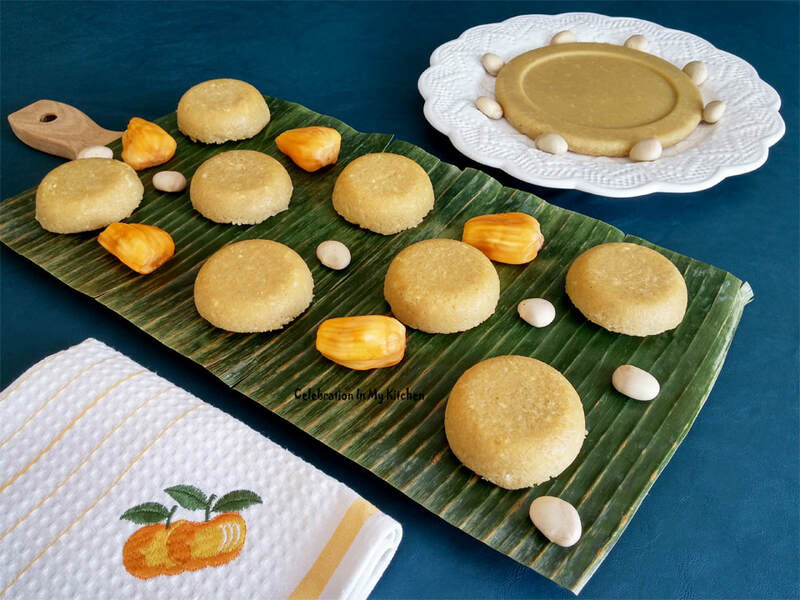 This is the unfermented variation of the jackfruit sandon or steamed cake recipe on the website. 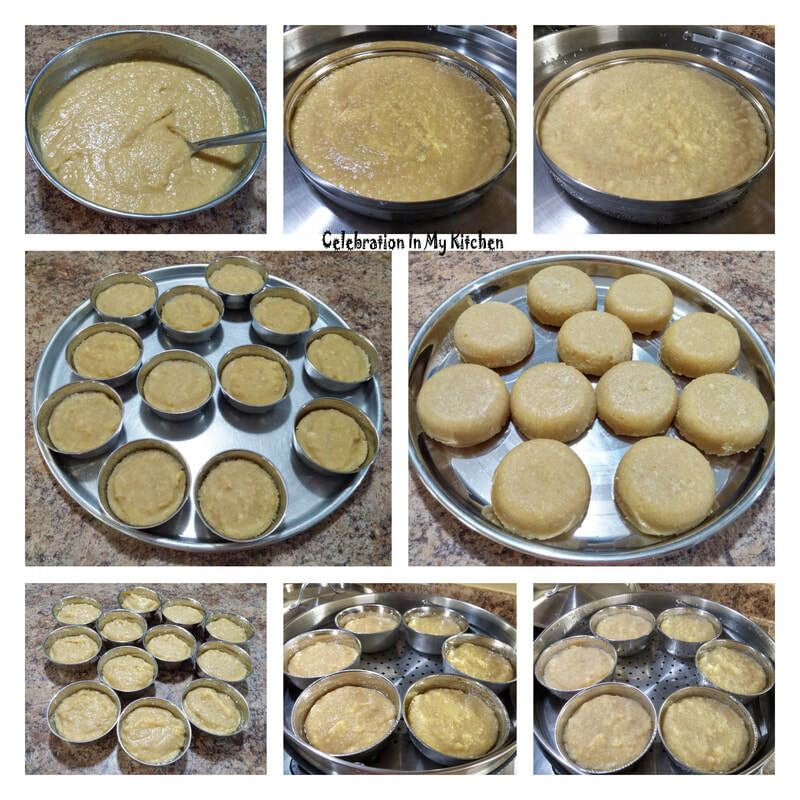 The batter is prepared by grinding soaked red parboiled rice with ripe jackfruit pods, jaggery and salt. 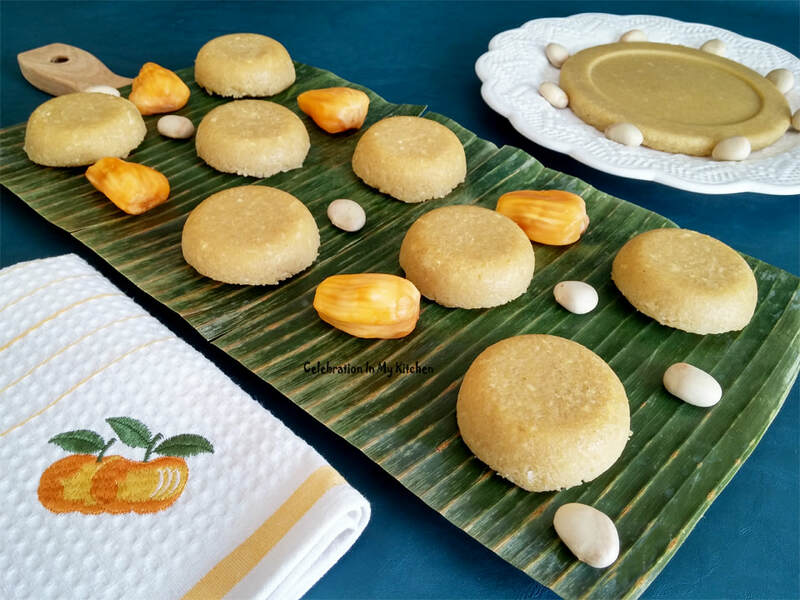 Steamed in moulds with the addition of grated coconut that adds texture and a pleasant delight to each bite. Easy to make and a great way to use the excess sweet pods from a whole jackfruit. Healthy, nutritious with a subtle taste of the fruit. To make a sandon, steam the batter in a deep plate or cake pan. 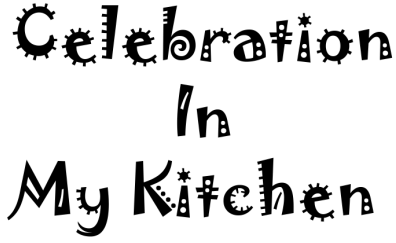 Leftover steamed cakes or pieces of sandon can be reheated (a couple at a time) in the microwave for 30 seconds. They turn soft instantly when warm. Perfect for breakfast or evening at tea-time, deliciously flavoured with jackfruit, filling and satisfying. 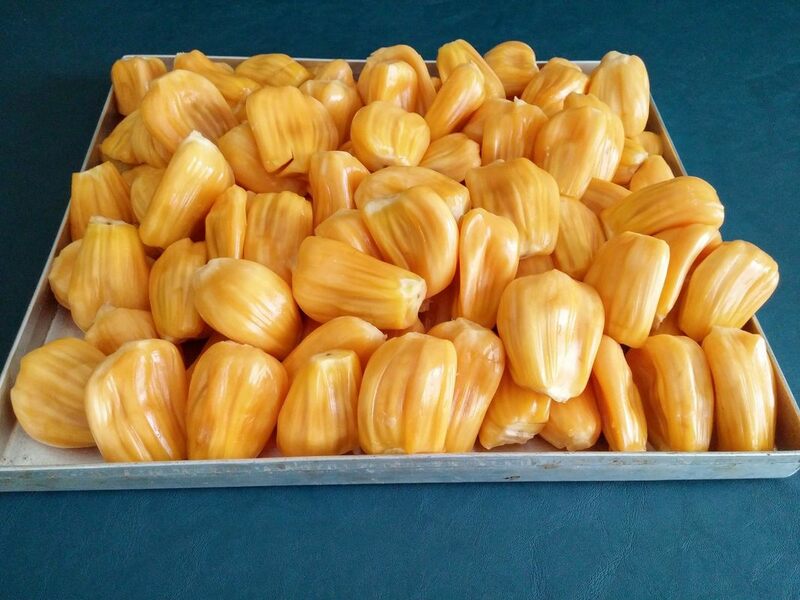 For the recipe on fermented jackfruit sandon or cake, information on the fruit and its health benefits click here. Note: No water required to thin down batter. The water used in grinding is good enough. Heat the steamer with water and lightly oil small round moulds, 7 1/2-inch cake pan or a deep dish. Pour batter into prepared moulds and pan. Steam in batches until a knife inserted in the centre comes out clean, around 8 to 10 minutes for the small cakes and 15 minutes for the bigger one. Carefully remove from the steamer and place in a dish with little cold water to cool. Run a knife along the edge of the moulds and pan. The cakes will come off easily. Red parboiled rice was used to prepare these cakes. For a thicker sandon (one big round cake), make 8 small cakes instead of 12, thereby using extra batter for one big cake. 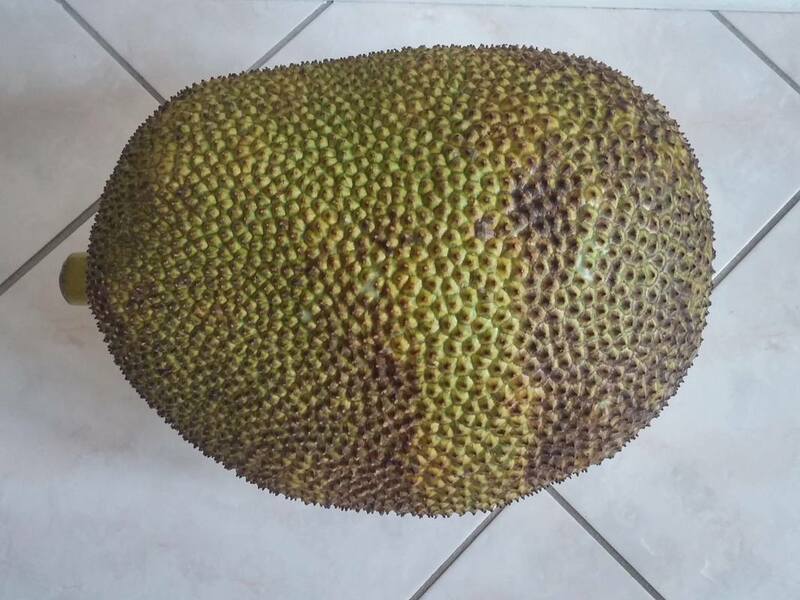 ​Whole jackfruits available at Asian stores in Canada.